There’s always something special released around Moogfest but with a week to go the Moog Grandmother is an unexpected delight. 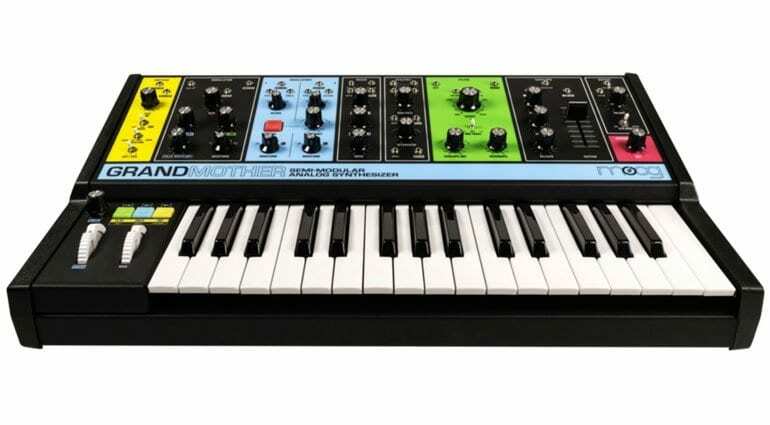 While it’s a shame to steal Moog’s thunder it’s definitely created a buzz. The look and the colour have caught everyone’s attention. 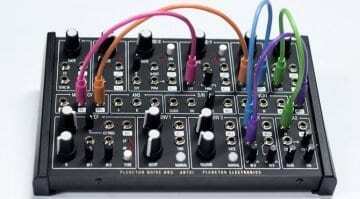 It’s a 2 oscillator analogue semi-modular monophonic synthesizer laid out in a modular style. Interspersed between the modules you’ll find 41 relevantly located patch points – a vast improvement (imho) on the patch bay layout of the Mother-32. The keyboard is by Fatar and slightly disappointingly the case looks like it is as well – all hard black plastic rather than the wood we like on our Moog products. 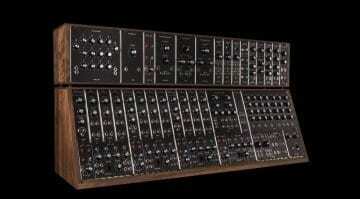 The modules consist of a dual oscillator with individually selectable wave shapes and hard sync. A classic 4-Pole 10Hz-20kHz Ladder filter and a patchable 1-Pole High Pass filter. Analog ADSR Envelope Generator and an analog LFO with audio-rate capabilities. 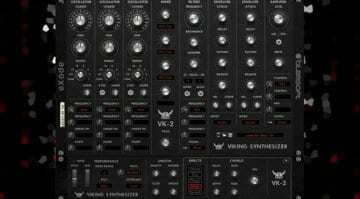 There’s a mixer, a mult and a 3 pattern, 256 note sequencer and arpeggiator. Inside the box is also a physical spring reverb, which is a pretty nice touch. It’s all normalised internally so it will play right out of the box but of course, the fun will come in the shape of patch cables strewn all over the Grandmother and your Eurorack. Moog’s rediscovering of colour has sent a few waves through the internet with many people declaring it ugly and tasteless – black is the only approved palette. That’s nonsense! This is a remarkable breath of fresh air. 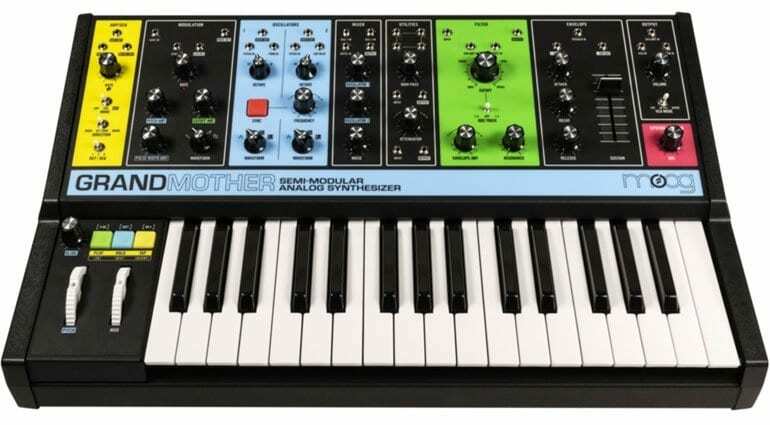 It harks back to the Moog Source, it radiates an idea of fun and adventure, and perfectly reflects your Grandmother – assuming she’s a tripped out hippy chick from the 70’s who was probably at Woodstock. 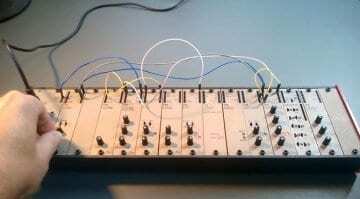 My only other question is whether this heralds Moog’s entry into Eurorack modules. The modules in this synth could easily be plonked into a Eurorack case, although in the Grandmother the front panel is a single piece. Maybe there’s more to come. 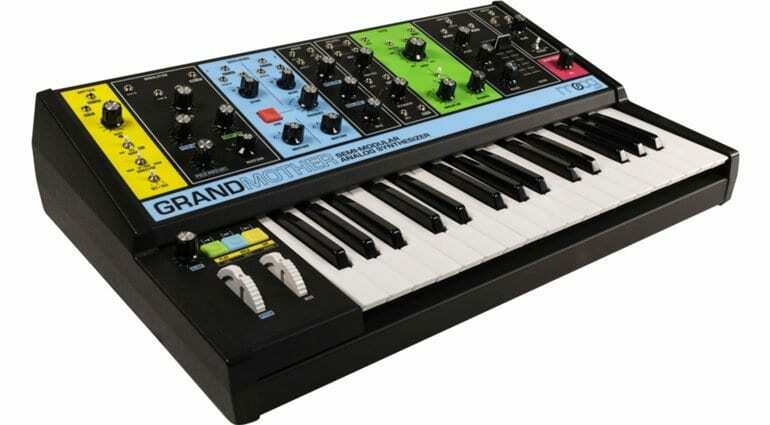 The price at $999 retail is a bit shocking for a monosynth but, in the coolest bit of marketing ever, it does come with a free denim jacket for your Grandma if you buy it at Moogfest for a special discounted price of $899. Looking forward to hearing it in action.